Personal Training and Mini Marathon training have kicked into high step! 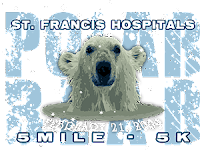 I completed the Polar Bear Run/Walk on Saturday. Earlier in the week, I definitely was getting nervous about not necessarily completing, but finishing in a decent time. My sister and my friend tAmMY (names are changed to protect the innocent) both agreed to walk with me for moral support. My goal was to walk 20 minute miles. A year ago I could barely walk a 30 minute mile! It was a bit balmy for a Polar Bear. When we started the walk it was a nice 28 degrees. I stretched and shook off my jitters. This man took a liking to tAmMY and decided he wanted to walk with us. The gun went off and away we went....and I mean people seriously flew by us (***swoosh***). I had flashbacks to the mall where the Senior Citizens run me over! tAmMY's new boyfriend decided he needed a new woman at about a half mile. He did turn around and gave her one last look. It was a bittersweet moment for him I am sure. Let me point out something here. tAmMY could have kept up with her new boyfriend, but came to walk with me and get some fitness for herself. I cannot thank her enough, because without her I probably would have quit between miles 2 and 3. In reality, my sister would have given me a stern talking to, if needed. Fortunately, tAmMY was never daunted. I got caught up on all the latest gossip with our friends and her co-workers. We also of course discussed how we could solve all of the world's latest problems. I am sure all of those people that were 300 feet ahead of us were not multi-tasking like we were! For Sister's part, she was learning things on her iPod as we walked the streets of Indianapolis. I must give a SHOUT OUT to the volunteers and IMPD. All were very supportive and had a kind word to say when we walked by them as we continued our walk throughout the city. Now my friends and faithful blog readers know that I can hold two conversations at once. The one that everyone sees and the one in my head. During the walk this is what was going on in my noggin'. -Some of those people ahead of us weigh more than me, how can they move that fast? -Who knew streets were so hard and unforgiving? -Where did the people in front of us go? I know! Space aliens must have picked these people up. -Since my sister was listening to her iPod I told tAmMY that it was okay if she was a block or two behind us as long as we could shout at each other. I shouted at her to make sure everything was okay and her feet were not hurting too much. At that point, all she would have had to do is give the word and I would have been OUT OF THERE! She did not answer. Bummer. -People do this for fun? -Why are there runners heading toward us? They finished and they are doing it again?!?!? -I despise you! -PT Bruiser (new name for the Personal Trainer) is going to be so proud. -I could go another 2 miles. -tAmMY pointed out some folks that had different colored bibs than we did. I mentioned that those folks were the 5K participants. I affectionately refer to them as "wimps." About 2 blocks from the finish TAmMY started sprinting to the finish line so she could beat me. Actually, she probably did not want to be seen with the back of the pack! Don't blame her there. We finished 10 seconds before it started snowing. It was then that I was reminded on Saturday that the big guy in the sky is on my side! It sleeted on us all the way back to the car, but thankfully we were done with the walk! I finished the walk with a 17.32 pace per mile. I was third from last to finish in the 5 miler. In looking at the results, if I had walked the 5K my ranking would have been A LOT higher. I am actually proud of what I accomplished on Saturday. Last Wednesday, Dr. Pita said I could eat a little more since I am exercising so much. I have tweeted a few times that I am HUNGRY a lot, so he did give me permission to up my caloric intake. Well, walking 5 miles makes a person HUNGRY. Sister and I decided to go to Bob Evans. Before we ate at Bob Evans that evening I had eaten about 1000 calories. This was to be my second to last meal of the day since I eat several small meals throughout the day. My goal was to eat off the "light" menu. For those that go to Bob Evans I am sure you are aware of the colorful picture menus. Well, the Boburrito was just too tempting to pass up and I HAD to have some potatoes AND a biscuit with my Boburrito. I was frantically typing in the mobile edition of Sparkpeople to find out how many calories (the idea of counting exchanges was thrown waaaay out the window once I ordered the Boburrito) were in a Boburitto. I figured out the meal I had just consumed was just over 1200 calories. Well, I had already eaten it, there was nothing I could do. However, I am absolutely, positively sure that THIS is not what Dr. Pita had in mind. "Would you like some dessert? Cherry cobbler, perhaps (my favorite)? Or some chocolate cake? We have a new pie." My sister banished her with; "Get thee behind me you devil!" I went to see Dr. Pita today. Everything was hunky dory at the clinic. I was only down a pound, but I dropped a couple of percentage points in body fat these past couple of weeks. That is much more exciting! I am now only seeing Dr. Pins and Needles every two weeks. *Whew* I can eat again with the money I am now no longer spending. Apparently, I respond well to acupuncture (his words, not mine). Your guess is as good as mine as to what that means! Whenever he takes the needles out of my head I bleed now! Freaks me out every time! What does that SIGNIFY?!?! Is it my brain leaking out??!? Is it toxins?!?!?! Is that good? Is that bad? He doesn’t seem to worried about it. Of course, he probably doesn’t worry when he leaves a bottle of water sitting somewhere that an evil person walked by and poisoned it . Okay, the Personal Trainer needs a nickname. She expressed an interest in a “cute” nickname. Since I like her and think she is keeping me in line, I MIGHT grant her the wish of a “cute” nickname. Suggestions are strongly encouraged in the comments to this blog post. Feel free to leave a comment with your suggestion. Yes, Personal Trainer and her friends you may make suggestions. I am walking and strength training a lot and obviously noticing some of the effects by losing body fat percentage. The walking is going well. Don’t tell Dr. Pita, but I am even doing Breath Walking while walking my miles. I would hate for him to be right about something . Speaking of “being right”… The other day I did not want to workout AT ALL. I was trying to think of each and every excuse possible. I could not find a decent excuse so I did it anyway. When I was doing with the exercise I felt better! WTF?!?! You mean all these years the experts were right?!?!?! You DO feel better after working out? Oi! What else could they be right about? Vegetables are good for you?!? Sleep is NEEDED? Processed food is bad?? This weekend, I am officially becoming a walking nerd. According to a friend of mine, I actually became a walking nerd when I started doing stretches at the stop lights while doing my walk the other day. However, I feel I am an “official nerd” this weekend because I entered a Run/Walk in FEBRUARY! Of course, I did order the shirt. I am not going to do it without getting the shirt, too! I will have my sister take of picture of me in the shirt and post it next week. I found a cool new web site. America On the Move allows you to enter your steps (approximately 2640 steps in a mile) or exercise minutes. In return, you follow a virtual trail with scenic stops along the way. For example, I am walking the Iditarod (the dog sled race). So far, I have visited Anchorage, Willow, and some scenic sites between the towns. It is a fun way to track exercise. This week I got 5 e-mails from old friends, new friends, and someone I do not even know regarding my weight loss and healthy living goals. All the letters had the same theme. They needed some encouragement or in one case a “kick-in-the-patootie.” I am absolutely positively NOT an expert on diets, exercise, or ANYTHING healthy. However, if you need someone to give you some encouragement I can definitely do that! The reason I mention these letters is that at the time I started receiving them, I also needed some encouragement. When I read them, it was like I had written a note to myself. Just because I have lost 63 pounds does not mean that a battle is won, or the fight is over. I have a long way to go, so I am not in a hurry. The battle will be fought for the rest of my life. You see, I am an emotional and binge eater. Every day I fight the urge to eat all of the Hershey kisses on the table at work or stop and get 12 wings at KFC because I am “bored”. Some days I win, but some days I lose and BIG. Ultimately, something is working. In about 4 weeks I will have been at this for 12 months. During this time, I am going to pause and reflect what worked for ME and what didn’t. I try everything the professionals suggest (how Dr. Pita EVER got me to do acupuncture for depression is still a mystery). I also read articles and listen to podcasts regarding healthy living. I had some successes and I had some failures, but I am finding what works for me right now. It may not work in the future, but for now I know what is working. To my fellow warriors, KEEP AT IT! You will find your way! February 11, 2009 - My Gnu Love! CAUTION: Before calling the doctor to have me involuntarily committed please read last week’s post. We are done, over, kaput! Much like the “Colonel” before you I must move on to those that will help me to live a healthier life. Your days of tempting and deceiving me with your fiber “treats” and hiding the truth buried where my naïve eyes could not see are behind me. My new love is Gnu. Yes, he is an animal (Grrrrr!) . YOU probably would refer to him as a beast. However, underneath his rough exterior is healthy natural goodness. I know what you are thinking. How did we meet? Well, my eyes were opened by Salmonella Sally. She was the one who told me the truth about you. She told me how you give the impression of being healthy (which you are, in a way), but there are healthier options. In other words, I needed to keep my eyes open until something better came along and...something did. I wrote about how you broke my heart last week and Gnu came along and swept me off my feet! Gnu sent me the following e-mail. I was reading your blog today and found your “take” on Fiber One Bars to be very amusing. I am a partner in Gnu Foods and we make a delicious, all-natural high-fiber bar that I am sure you and your dietitian would approve of. Gnu Bars have 12 grams of fiber, are low calorie and have no high-fructose corn syrup or added sugars, like a lot of so-called “healthy” bars have. I’d like to send you some samples and hear what you think of them along with some nutritional information. Please send me a snail mail address and I’ll get them out to you. 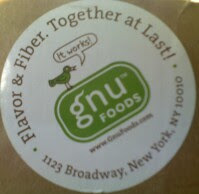 www.gnufoods.com to learn more about us. Sure enough, Gnu is true to his words. I received a box of Gnu Bars. See how confident he is? He gnew I would immediately fall in love with him! I read his ingredients and they are perfect -- all natural and healthy. See for yourself! The taste is absolutely divine. Sure, I have favorites. Who doesn’t? 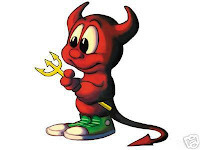 I only really had ONE choice with you that I enjoyed, but with Gnu I have THREE that I now will not be able to live without. Orange Cranberry – My ABSOLUTE favorite. The bar is nice and chewy and quite tasty. It does not taste like a high-fiber bar at all. There are 3 grams of fat, but 3 grams of protein off sets that quite nicely. Cinnamon Raisin – It is like eating a chewy cookie! Who doesn’t like a Cinnamon Raisin cookie? Banana Walnut – I never knew bananas and walnuts were perfect when married! Chocolate Brownie Bar and Peanut Butter Bar – I enjoy them, but for me they are not as good as the top three. These are quite good with some milk. You know what else? I can order a big packet of them ONLINE! Yes, "General" ONLINE! Because he loves me so, there is a 20% off discount until Valentine's Day. Did you ever do that for me? No! General, I hate to tell you this, but my new adoration is so strong it turned me into a poet. I wrote a limerick for Gnu. it will even help you go poo! We have a new character today - Salmonella Sally. It all started when I was speaking to the dietitian today. I was asking about complex carbohydrates. As the discussion continued, I informed her of my favorite carbohydrate filled food...Fiber One bars. She had the nerve to tell me that my most favorite "healthy" food is FAKE! What?!?!? She said the fiber in those bars is not as good as whole grain. I need took look at the ingredient list on my breakfast bars and make sure WHOLE GRAIN is listed first. Okay, FINE. I hate you General Mills for tricking me! He is probably not even a real General either. The dietitian decided to give me some alternatives to Fiber One bars. The first option she mentioned was whole grain bread and PEANUT BUTTER. WHAT?!?!?! Are you crazy?!?? Have you not read the news lately?!? Peanut butter is KILLING people! My goal is not to eat ANY PB until the coast is completly clear. Thus, the nickname of any dietitian right now is Salmonella Sally. You like it??? My sister came up with it. Of course, all the nicknames are chosen to protect the very nice and intelligent people that are teaching me to live a better life and are meant in the nicest way. I highly respect all of the professionals I mention on my blog. Speaking of the OTHER professionals (Dr. Pita and Dr. Pins and Needles), these two are on "my list" this week -- Dr. Pins and Needles for insinuating that acupuncture is part of the reason that my face is thinner and Dr. Pita for (????). Now I do not remember why Dr. Pita was on the list. Well, he is going to stay there until I remember why. I will keep him on the list until my 3rd eye quits bleeding after acupuncture. Dr. Pita is the one that referred me to Dr. Pins and Needles so he needs to take some of the blame. Well....I tried Mall Walking this week. Did you know there is a whole subculture of mall walkers? They can be a bit scary, but you must respect their ways. The mall near where I live is exactly 1 mile in the perimeter, so the plan is to go there sometimes for a change of scenery and to get away from the large clock in front of the treadmill. -The Sprint guy is not selling much. -Some people think that it is a good idea to get teeth whitening in the mall. What?!?! -There are a lot of other people at the mall that need to be losing a few pounds. Oh my! -The guy at Johnny Rockets REALLY likes to dance to Stayin Alive. -The market bottomed out for Vera Bradley purses. -Build-A-Bear is still going strong. Pick me! No, no! Pick Me! -Some mothers do not know what their teenage daughters are wearing to the mall. -Deb has some of the cheapest/tackiest looking prom dresses I have seen. -Von Maur still has the nicest restrooms. I am now officially down 62 pounds!